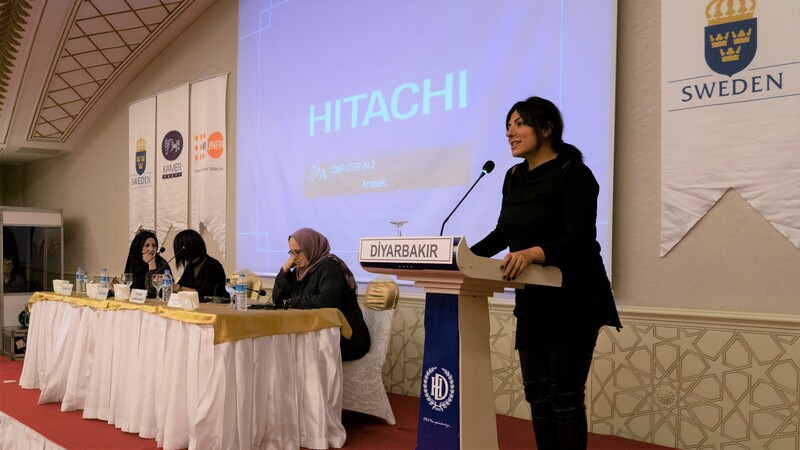 Diyarbakır 7 November 2018 - KAMER Foundation which is one of the implementing partners within the scope of Humanitarian Aid Program of United Nations Population Fund (UNFPA) Turkey Office, held a panel with the theme “Strong Women, Strong Families, Strong Society” on November 7th, 2018 in Diyarbakır prior to 16 Days Activism Campaign (November 25th – December 10th, 2018) within the scope of International Response for Ending Violence Against Women. 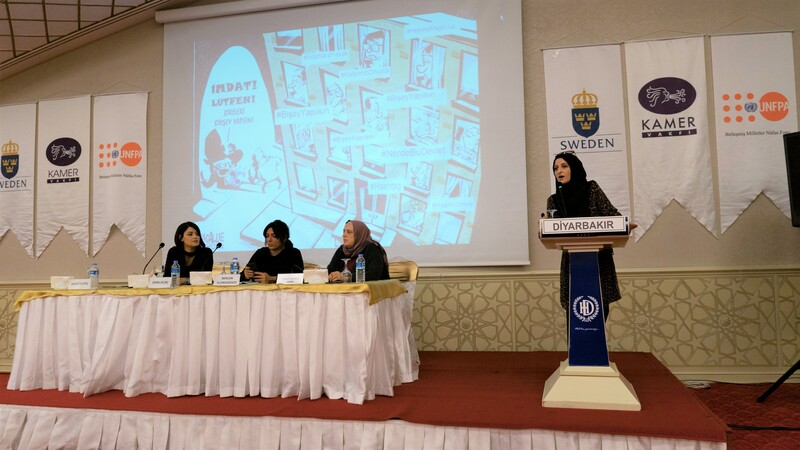 The Panel in which 450 Syrian women who benefited United Nations Population Fund’s (UNFPA) Women and Girls Safe Space was organized by UNFPA’s implementing partner KAMER which is financed by Swedish International Development Cooperation Agency (SIDA). United Nations Population Fund (UNFPA), Representative of Turkey, Karl Kulessa, who made the opening speech of the panel stated that “Today we will receive valuable information from the participating specialists of this panel related to the reasons of violence against women, how do women get effected by the violence both in psychological and physiological aspects and what kind of opportunities do laws provide in order to protect women and what kinds of services are available in order to take victims under protection. I would like to convey my thanks to Diyarbakır Provincial Health Directorate, Diyarbakır Governorate, Diyarbakır Provincial Directorate of Family, Labor and Social Services and of course to our implementing partner KAMER and to Swedish International Development Cooperation Agency (SIDA) for their financial support and for their valuable contributions for realizing such an important panel” . 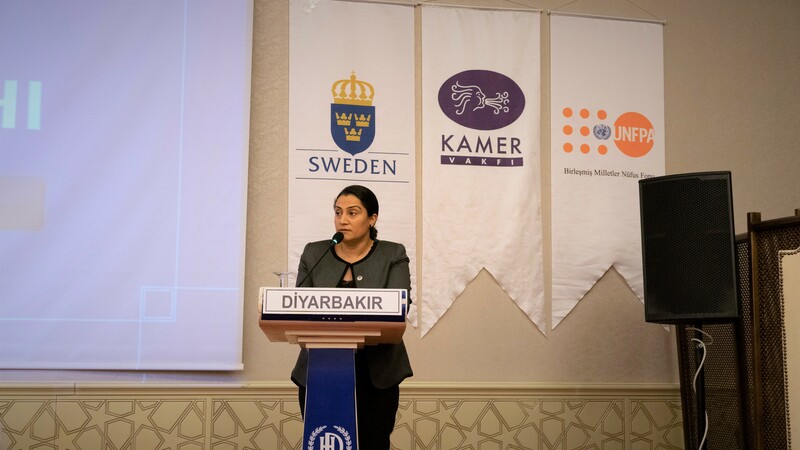 Project Coordinator Ayten Yakut Süngü who took stage on behalf of KAMER Foundation, stated that “Violence against Women continues to be a problem and hurting issue both in the World and in Turkey. Within this context, KAMER Foundation was established in 1997 and conducts studies on women rights in 23 provinces and districts at the regions of Southeastern and Eastern Anatolia ever since. Since 2017, KAMER Foundation conducts Women and Girls Safe Spaces Project in cooperation with United Nations Population Fund (UNFPA) in 6 provinces with 7 centers. Within the scope of this project, we give support and services related to psycho-social issues, gender related violence and sexual and reproductive health” and continued listening to the presentations of beneficiary women who came to listen to the panel from Women Health Center and various panel speechmakers in various specialty fields related to violence. Following presenters participated the panel to talk about given topics: Rukteye Ateş, Social Services Specialist from AÇSP Provincial Directorate to make presentation about Family, Labor and Social Service Directorates’ Support Programs; Specialist Zehra Kılınç from Diyarbakır Provincial Health Directorate with her presentation on Psychological and Physiological Damages of Violence; Attorney Berçem Alemdarzade from Istanbul Bars Association with her presentation about Contracts, Laws and Communiques that Protect Women against Violence, and Assistant Professor Hidayet Şefkatli Tuksal from Islamic Sciences Faculty of Kırıkkale University with his presentation titled Violence Against Women and its Social Grounds. Rukteye Ateş, Social Services Specialist from AÇSP Provincial Directorate who made a presentation about Family, Labor and Social Service Directorates’ Support Programs gave information about that 1.4 million women loses their lives as a result of violence in the world and expressed that one in each three women is exposed to a kind of violence. 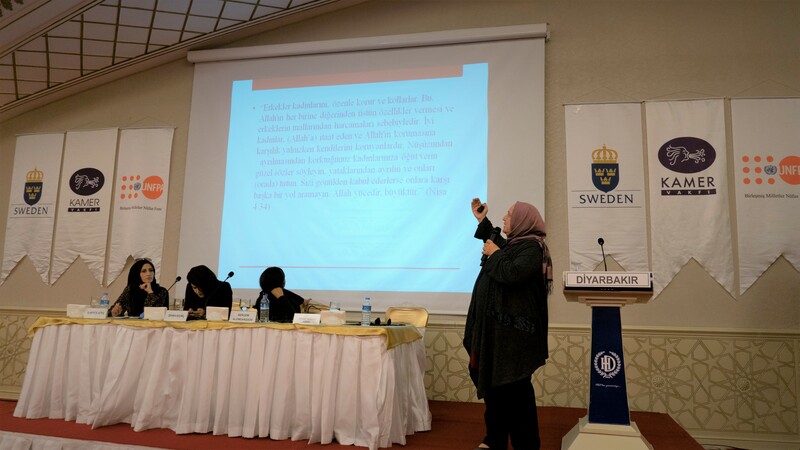 Specialist Zehra Kılınç from Diyarbakır Provincial Health Directorate introduced the types of violence in her presentation on Psychological and Physiological Damages of Violence and any marriage under 18 years of age is a type of violence. 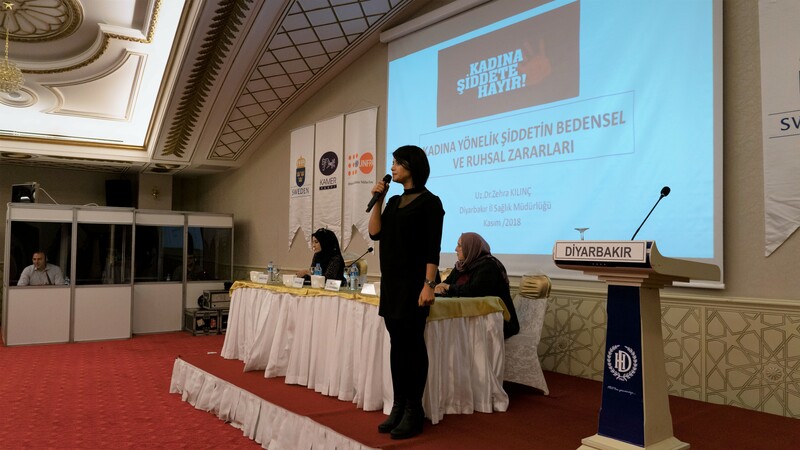 Kılınç gave information about psychological needs of women who are exposed to violence. Another speaker of the panel Attorney Berçem Alemdarzade from Istanbul Bars Association made a presentation about Contracts, Laws and Communiques that Protect Women against Violence. Attorney Alemzade made a mention of legal rights of violence sufferer women, and again expressed that any marriages under 18 years of age are accepted as a crime and such marriages under 18 years of age are seriously prejudicial with respect to physical and mental health. The last speaker of the panel Assistant Professor Hidayet Şefkatli Tuksal from Islamic Sciences Faculty of Kırıkkale University made a presentation titled Violence Against Women and its Social Grounds, In his speech Tuksal stated that “Our Religion does not give a message that women are created for men; when we review the verses we see that men are not shown as super creatures, we are all here to create our own story. What does it mean being a spouse in a marriage; if there is no affinity, grace, solidarity in a marriage, that means this marriage could not fulfill its objective” and added as follows “never accept legalization of violence through religion”. 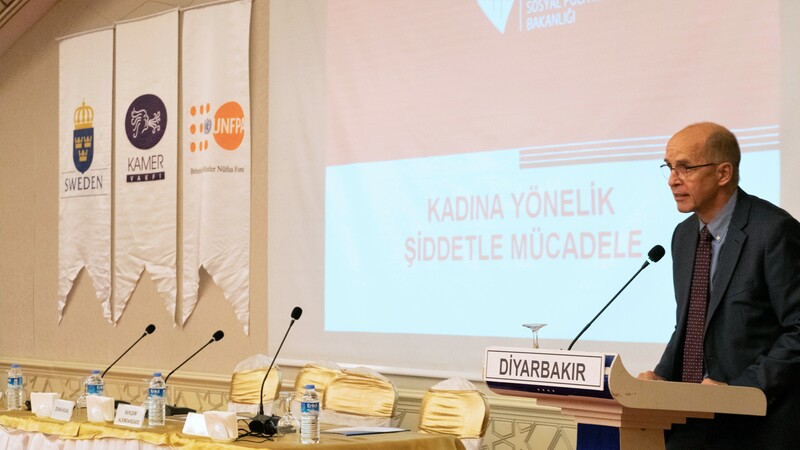 United Nations Population Fund (UNFPA) Turkey's humanitarian aid program continues to empower Syrian refugee women with the 35 Women and Girls Safe Spaces loacted in 17 provinces thanks to the implementing partners such as KAMER Foundation.